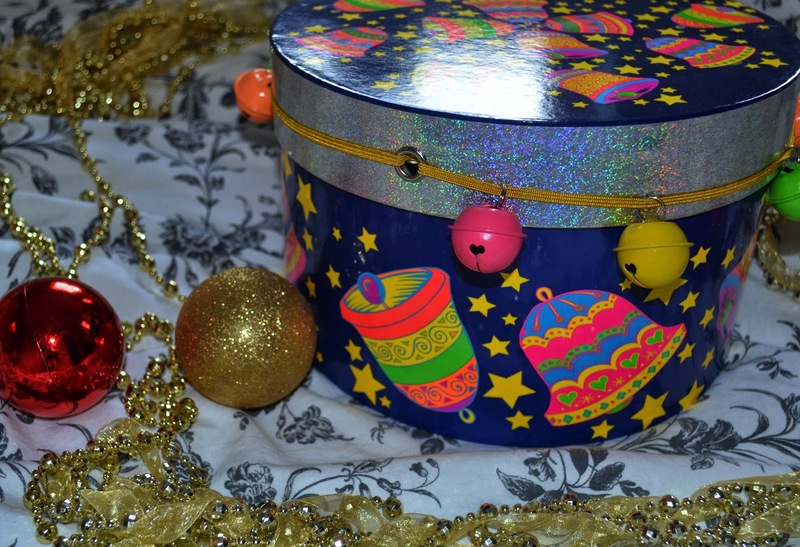 I long time thought about if i should post such a post since i really do not want to look like a show off but then i enjoyed this posts so much from other bloggers that i thought i will do it too. I was really blessed this christmas with some very thoughtful gifts from my husband and my family. I have the feeling that beyond the material value, what mainly made me happy about this gifts, is that they show that my hubby and my family really know me and put effort into getting me something i would really love. So the first thing i like to show you is this wonderful christmas gift box from Lush which i got from the best sister in the world. I am starting my last year of my PhD and i do not get a lot of time to myself. If i do get the time i just love to take a bath and forget the outside world for a moment and well there is just no competition when it comes to bath bombs to Lush. This perfect little treats which are at the same time whimsical and the perfect spa experience. To be honest i really love the box too, so i will definitely keep it after i went through all my little pamper experiences. I posted the backside so that you can see what is in there. 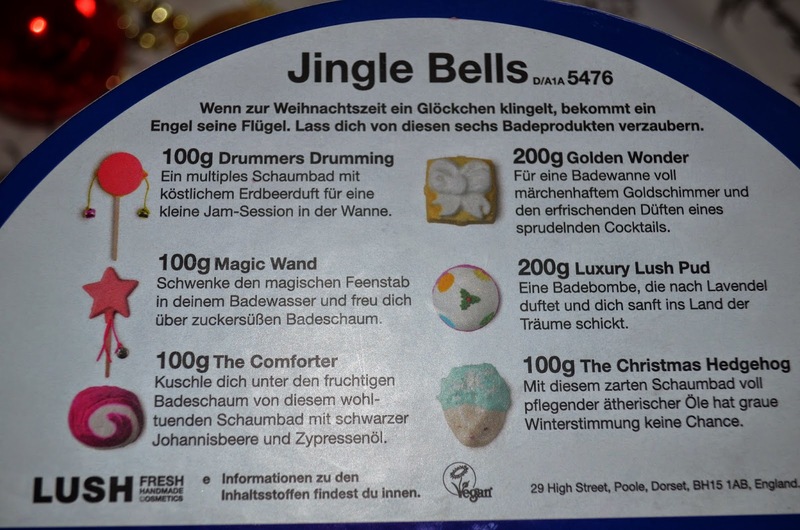 The labeling is in german since my family lives in Germany but the names are the same like in Britain. By the way, it was my sister as well which baked this wonderful cookies in the picture above. We had this year christmas eve at her place and even though she was sick, she went out of her way to create the perfect christmas. On the second christmas day, my husband and me had our christmas gift exchange and he has outdone himself again. He got me this Honeymania giftset. To understand how thoughtful this gift was, you need to know that i am absolutely in love with honey. For me there is nothing better then a perfect cup of tea with honey. When we were just dating, my now hubby actually took me to a honey shop in which spend ages testing each honey. A while ago i recieved a little sample from the honeymania body scrub and mentioned how much i looved the smell. So this most wonderful of husbands went out and got me the biggest gift set. This set contains a shower gel, the body butter (this is sooo moisturising), a bigger sized body scrub, a honey soap and a little shower fluff. 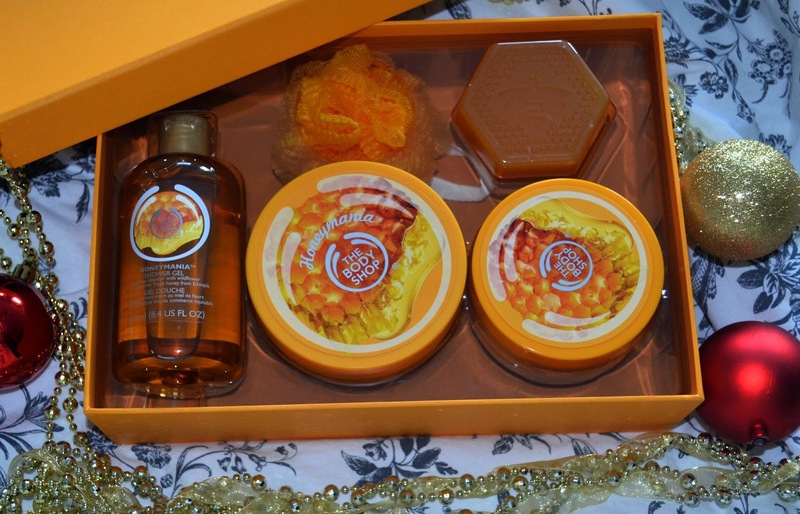 This body shop series contains real organic honey and the scent is to die for. In fact i took a shower with the gel and the body scrub and then afterwards put the body butter on and went to bed and i have rarely been so relaxed as with this wonderful honey scent in the air. If you love honey as much as i do, then you HAVE TO get this. 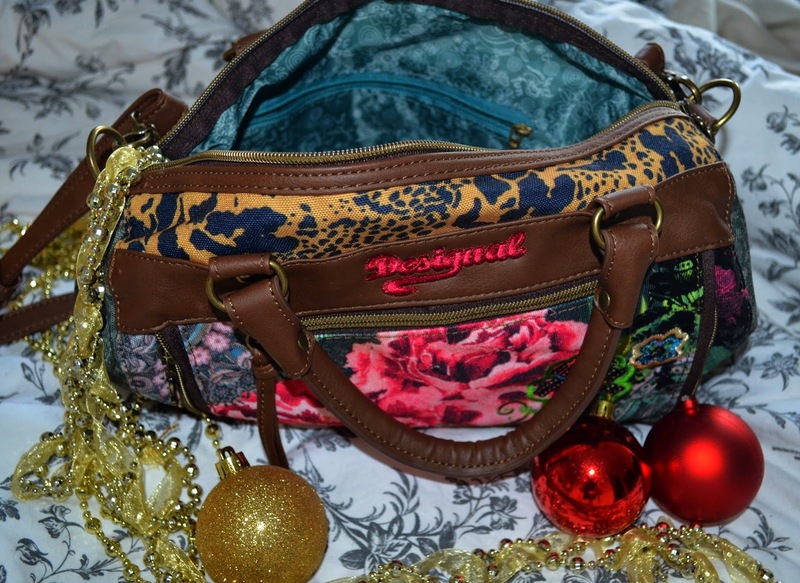 The second thing my hubby got me was a Desigual handbag. I have a great love for this brand. Their clothing and accessoires are so colorful and full of life and at the same time feminine. Just looking at their stuff brightens up my day. I really was in need for a medium sized handbag after my bunny chewed on my old one. I had been carrying arround for a while my big cognac colored shopper which i love but sometimes you like to look a bit less like you are going on a weekend trip. So my husband got me this wonderful Desigual handbag. I do not own a handbag from them yet and i looove this one. So yes, another hit. So the next present my hubby got me requires some explanation again. When we got married at cityhall (we had a big church wedding the next day), we went out afterwards to a small cosy restaurant to have some dinner with the best man and maid of honor and the family. There on the table they had the cutes little salt and pepper shackers which looked like two little figurines hugging each other. I fell in love with them and when i saw salt and pepper shakers as hugging bunnies i had to have them (this was arround eastern). Then Eddy (my cat) decided one day that they did not fit our decor and knocked them off the kitchen counter. 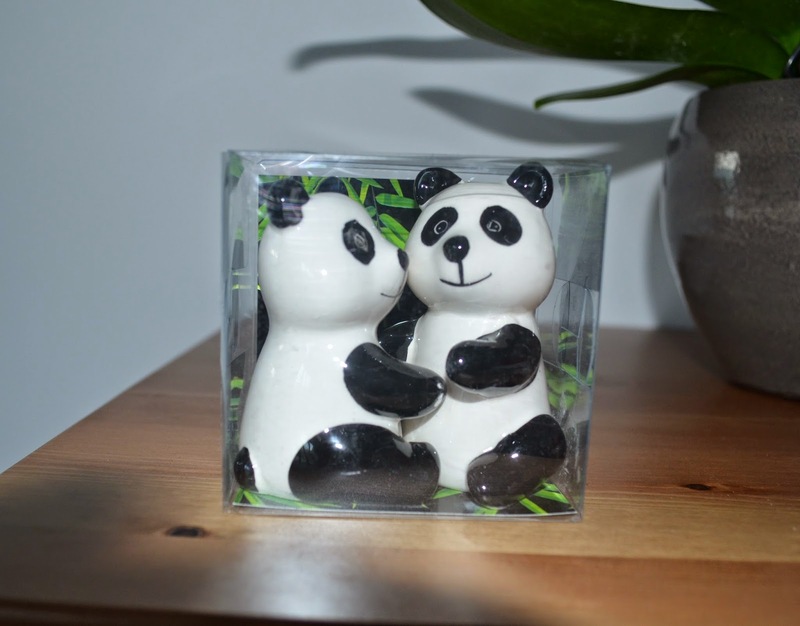 Then my husband found apparently those two which combine my childhood love of Pandas with my need for a cute salt and pepper duo. So well here we go. The third incredibly thoughtfull gift. This might not be the top of style and you wont find them in any interior magazine, but to me they are perfect. 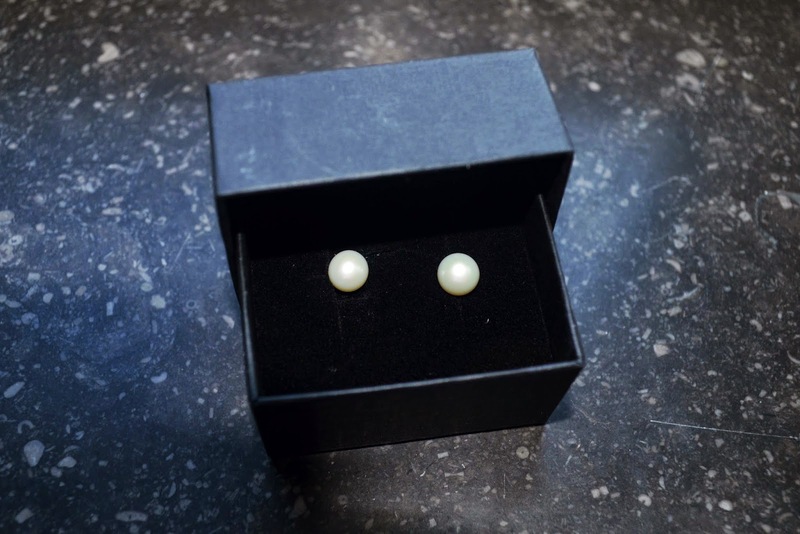 The last thing i liked to show you guys is this wonderful set of pearl earrings. Now this might be old fashioned to some people but i still think every woman should own a pearl necklace. I just love this for formal occasions and i have worn one for my highschool and university graduation. I so far always lended the necklace from my mum, but a while ago she gave me one of hers for keeping (love you mum). So now for christmas they gave me matching earrings which are so lovely. I hope to wear them one day when i defend my PhD. So this was some of the wonderful gifts i got from my family. I have to say one of the best presents though was to see all this wonderful people i love and that i am so lucky to be able to spend this christmas with them. There was even several gifts for my cat Eddy and my bunny Louise. And at this point i also like to express my gratefullness for you my wonderful readers without whom my little corner of the internet would be very lonely. Wonderfull presents & thank you for giving me some wonderfull gifts from The Body shop. Wow that's some really lovely gifts. I'm drooling over the lush gift set, so nice.